All Soft-Ride products are designed to help keep your horse healthy and comfortable. If you can’t find what you’re looking for, please give us a call at 855-763-8743 in the US, or 281-334-2576 outside the U.S.
"If they are in the trailer, they're (Soft-Ride Boots) on." "One of my favorite things to make sure my horses are safe in the trailer are Soft-Ride Boots. " "I use Soft-rides all the time...They've kept my horses sound for years and years...Nothing compares." "My vet suggested getting a pair of Soft-Rides...they helped so much I use them on everything I have." "We use Soft-Rides as preventatives....You can't start off with a horse that's tired." 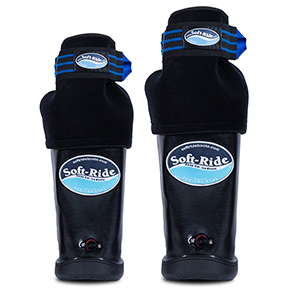 "Soft-Ride Boots increase circulation and lower the impact on the joints." 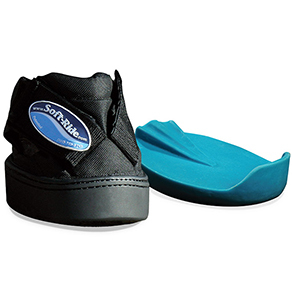 "These Soft-Ride Ice Spa boots have a place for every type of performance horse." "It is the only effective therapy for laminitis." "I don't think I would have been able to compete this week without the Soft-Ride Ice Spa's." "We absolutely love them. They’re worth every penny." 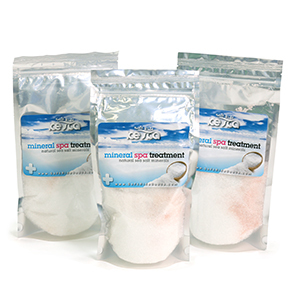 "I was first introduced to the Ice Spa a couple years ago and I fell in love with it right away." "We use the Ice Spa almost daily." 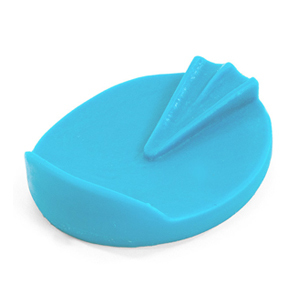 "The best icing method I’ve ever seen." "If they pick up the foot they stay in it so they learn to stand quieter in the boot"
"We have 9 head of horses here and every one of them came in with a set of Soft-Ride boots on." “We have 9 head of horses here and every one of them came in with a set of Soft Ride Boots on. Anytime I get a little bit of soreness in them, we let them stand in them and it is such a helpful tool. We’re going to get this mare ready for the Soft Ride to put the mare in ice for a while. Gonna put the sleeve on, the collar on as tight as we can to keep it held up, lift the mare’s leg, and just let her step right into the boots herself. Trying to get her toe to the front of it as much as possible, so when she sets her foot down, she sets it down flat in the boot. Go on the inside and hook our buckles first, to keep it held up tight. Now she’s ready to add water, add the amount of water that you want to use, then we’re ready to add the ice to it. Same scenario add the amount of ice that you want to use and put it right in there. Then we lift this up, to keep all the coolness in as much as possible. It has velcro you can pull extremely tight, if you’d like it, going over the top of the knee to hold it all in place and you’re completely ready for that mare to stand in those boots for as long as you want her too." “Hi, I’m Julie and I’m here with Simon and we’re at Sutters Run Farm, the base of Ariel an upper level event rider and we’re here to show you the Soft Ride Ice boots that we’ve had for about a year and absolutely love. They’re worth every penny. So I’m just here to show you how easy they are and why we love them so much! So to start with, this is the boot, and this is the cuff that goes around the pastern and then Velcro’s into the boot, so I will show you how to do that. So the cuff has three tabs, two angled that will go on either side toward the front, and then one straight tab that goes in the back towards the heel. Then theres the velcro that attaches, double sided in the front and it goes on just like so - with your two angled tabs up front and your flat tab behind. So once the cuff is on the horse’s leg, and you are ready to put it in the boot, there are three velcro tabs - be sure they are velcro-ed back so they’re out of the way and they’re easily accessible when you go to actually attaching it to the cuff. Pull the back velcro, right by the heel so you can grab the boot. So you put the toe in first, let the heel rock back and press the velcro and then let the horse step down. So the back velcro got attached when he stepped down, you want to now pull this down by the loop and velcro it to the front tab, and do the same on the other side. The more velcro, the more secure you can get the velcro, the better it will be if the horse decides to dance around or step out of it. Once you’ve got the velcro tabs attached, you pull up on both sides and then you just zip up. Now that we’ve got the boots on, you’re going to fill it with water, to about a third, maybe half full, you can tell how full it is by the hose. You can see the water levels about right there, I’m going to fill it about half full before I put the ice in. I’ve got almost half here, and almost half here - so now I’m going to put the ice in. Alright so now I’m going to add ice, I’m going to use my hands as a funnel, while I pull the boot out at the same time, put in as much ice as you need, and then you can add more water. Alright so now that I’ve got the ice and water started, I’m going to add some more water, in this particular case I want to bring the water level up so that I can get his knee also. I’m going to watch it here, now that I’ve got the water where I want it, I’m gong to close up the boot which will help stabilize it and keep the cold in. Like so, and the same thing on this one and there you go. SO one of the other things I love about these boots is that you can easily turn them into whirlpool boots. So heres the hosing, you’ve got a main hose, connected to a split. You take the split and put it over the horses shoulders. So once I’ve got the hoses on, be careful if its your first time putting them on, some horses may think its a little bit weird. But once the hoses are around the horses shoulders you’re going to take this end and simply just slide it over the hose and you’re ready to go. Then I’m going to take this end and connect it to my air hose thats connected to my air compressor. Taking them off is even easier than putting them on. You take the velcro there and the Velcro there and then you unzip - I like to unzip the far one so that I’m not unzipping the water into me, and then like so and then the same on the other side and there you go. Then un-velcro and step out and you’re done!